Rajamouli’s ‘Baahuballi’ has joined the 100 crore club within two days of its release which is a record for an Indian film. So far many Indian films have collected 100 and the list includes quite many Bollywood films like ‘PK’, ‘Three Idiots’, ‘Chennai Express’, ‘Ra One’, ‘Kick’, ‘Dabaang’, ‘Tanu Weds Manu Returns’ etc. The list also includes some south Indian films ‘Enthiran’, Viswaroopam’ and ‘Kaththi’. Now ‘Baahubali’ comes as a proud entrant that too in just two days of its theatrical release, a record which no other Indian film has achieved. As reported earlier, ‘Baahubali’ which released in 15 languages in 4000 screens across the world had garnered Rs.60 crores collection on the first day of its release and on the second day it has collected Rs.55 crores putting the total to a whopping Rs.115 crores. Out of this the Indian theatrical share is Rs.90. 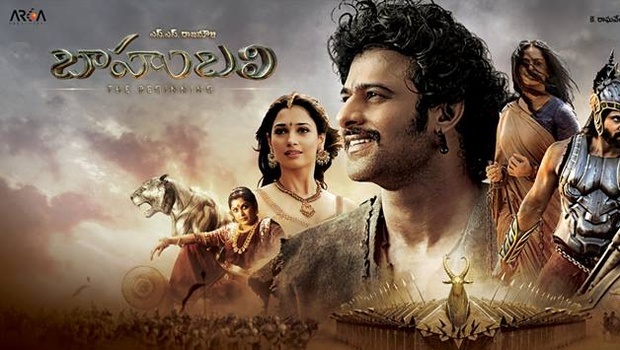 ‘Baahubali’ stars Prabhas, Rana Daggupathi, Anushka, Tamannah, Ramya Krishnan, Sathyaraj, Nasser and many others. The film was made as a Tamil-Telugu bilingual. Ilayathalapathy Vijay to dance for a Mammootty film?